Nine months now into the La Marguerite blog, and I forgot the green bags again. If I, out of all people, still goes blank about the bags, what does that say about the rest of the population? The North Karelian Experiment came to my mind. I can write and talk about green until I am blue in the face, but if the environment is not there to support me, not much is going to change. As long as the ‘Paper or Plastic‘ option is available, there is a part of my brain, that says the hell with all your green tirade. ‘Paper or Plastic’ represents one more piece in the Not So Green Exposure Project. The day Whole Foods ceases to provide the delinquent receptacles, I bet you, I will suddenly, miraculously, remember to bring the green bags. I am a Green Girl Wannabe, an habitual green sinner, no longer looking for redemption, but solutions to help me sin less and less. My attempts to look inside have only succeeded in making more conscious. They have done little to change my natural behaviors. I am thinking of the overwhelming majority of other folks who are just like me, and the immensity of the problem. And I keep going back to the need for external controls. From now on, for every admission of green sin, I will have a ‘What I need’ comment. Each time, I will imagine and share a type of external control that would help curb this particular behavior. Example in point. 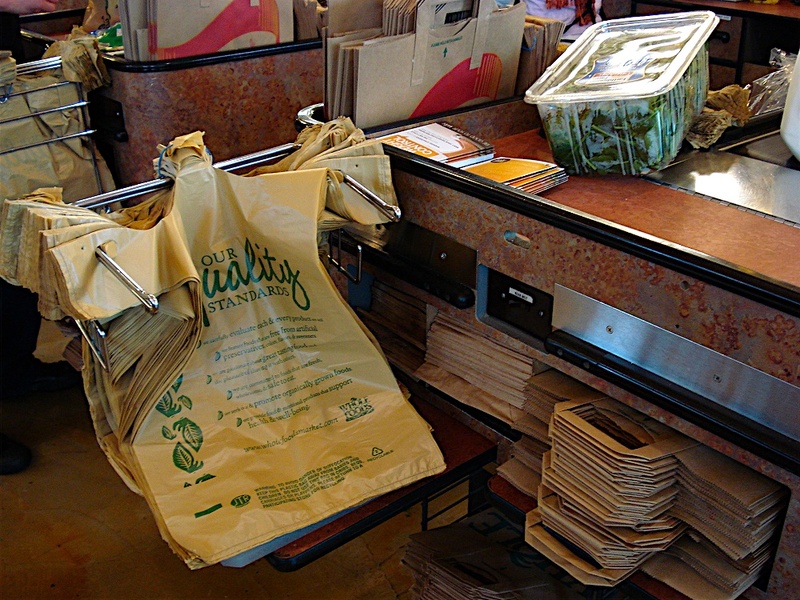 Yesterday, I was at Whole Foods, without the green bags again. That’s when it really hit me. On my own, I just can’t do it. I need something more drastic. What I need : No more rescue with free plastic bags. Whole Foods needs to stop giving away the bags. Instead, they need to make it really inconvenient for me, and ridiculously expensive. They should only offer the green bags, the recyclable bags that cost a dollar each. I have started noticing an interesting phenomenon. Many of my friends who read my blog, are telling me they think of me now, and of the things I write before they act. And they report making small changes in their daily life, as a result. They remember to take their green bags to Whole Foods. They think twice before declaring something dirty laundry. They stop, before clicking on the Order button. They think of me, and my ramblings, and they start thinking, and acting differently. They are even becoming greener than I am. My main interest in writing the blog was to understand how personal psychology can affect an average person like me, in relationship to making, or rather not making, the lifestyle changes that are necessary to solve the climate crisis. Hence, the goal was not to change myself necessarily, at least in the short term, or anybody else for that matter. That so much positive action has resulted, speaks to the power of confession, and of being real. Yesterday was especially busy, and the green bags were last in my mind. The bags stayed on the door knob, and I had an interesting chat about that with the lady bagger at Whole Foods. Apparently, I am not alone. Thousands of people every day, also forget.